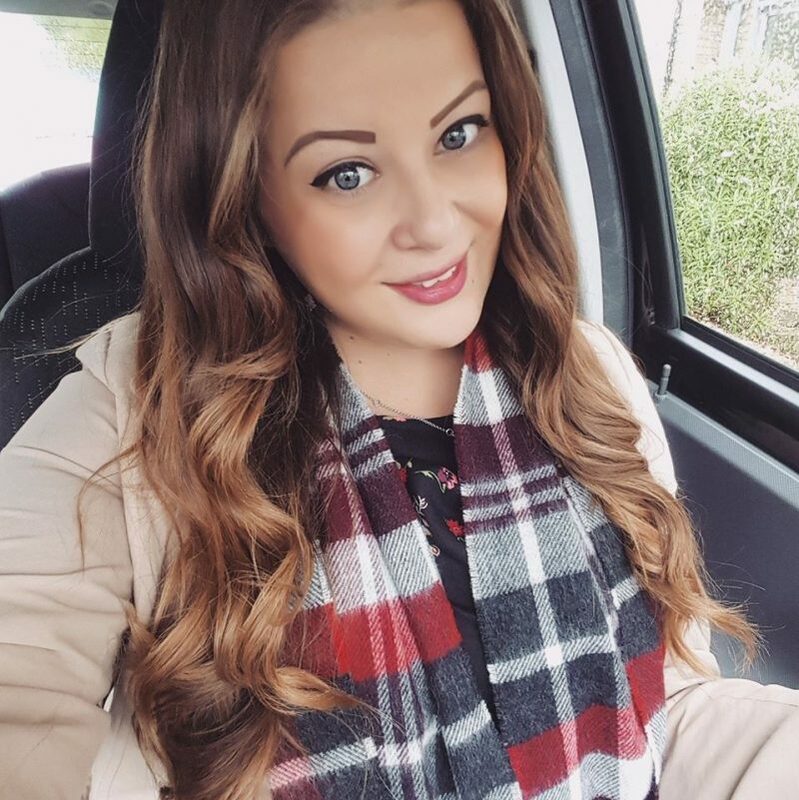 In my last blog post on my new flat I did a little tour of my kitchen, so now I’m doing the same again but this time it’s on my new bedroom! The bedroom is quite small and also a bit of a funny shape, so when I first started moving my stuff in I was a bit worried about how it would all fit in and how it would be best laid out. But in the end with a lot of shuffling of things around, here it is! Firstly I can only apologise that these photos are not great quality, but have you seen how dark it is outside lately?! Luckily the bedroom has quite a large window so it does get a nice bit of light in. I decided that the bed (Ikea) was best placed in the middle of the room where there was a bit of an alcove and it fits just perfectly! The beautiful duck egg blue and grey floral bedding is from JD Williams and the cute cushions I’ve collected over the years from Dunelm. I absolutely love my bed and it’s so cosy and snug! Perfect for lazy Sunday mornings. On my side of the bed I have an old wooden bedside table which was plain wood but I upcycled it into something I love. 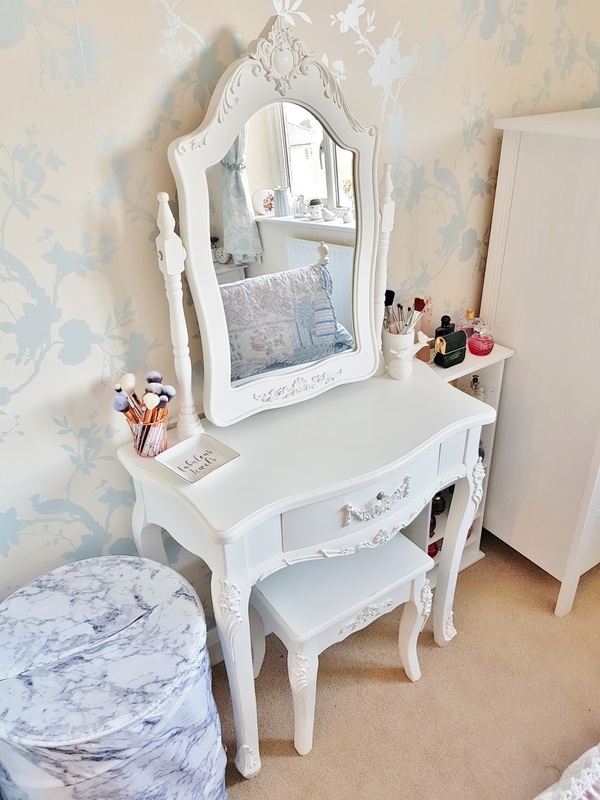 I posted on my blog back in 2013 about how I painted it white and then added some crystal knobs (see the before image here), and I’ve now also added some marble sticky back plastic to the top. So it’s now more practical as it’s wipe clean and looks even better! If you want to find out how to make a marble topped table you can read my DIY blog post. 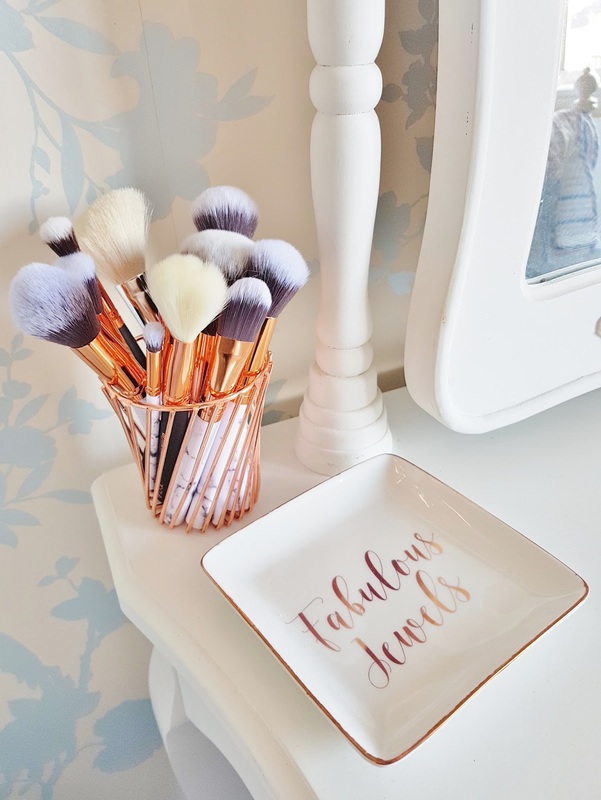 I also used the marble plastic to customise my cosmetic brush pots which are simply made from old jam jars! 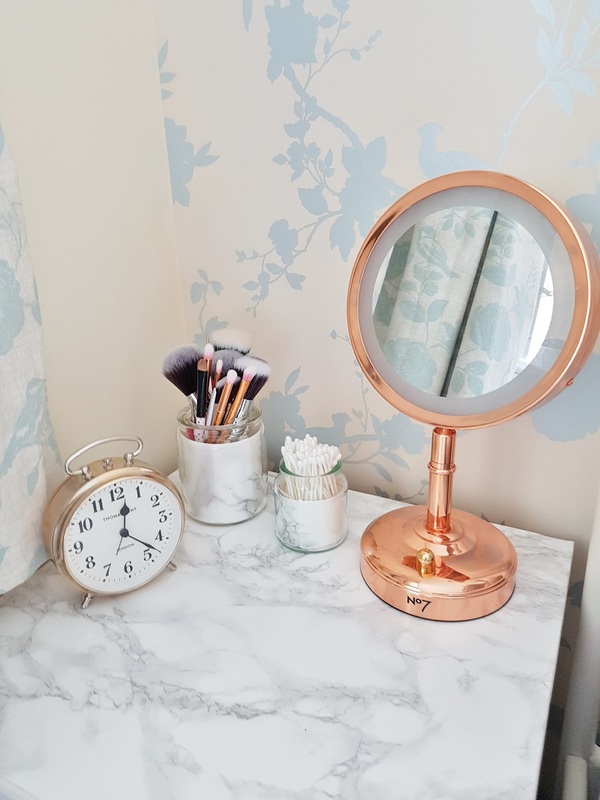 Also on the bedside table I have my rose gold light up mirror that I recently bought from Boots, and a little rose gold alarm clock by Thomas Kent Clocks from Hurn & Hurn. On the other side of the bed I’ve used the smallest from a nest of tables because there’s only a very small gap between the bed and the wall! 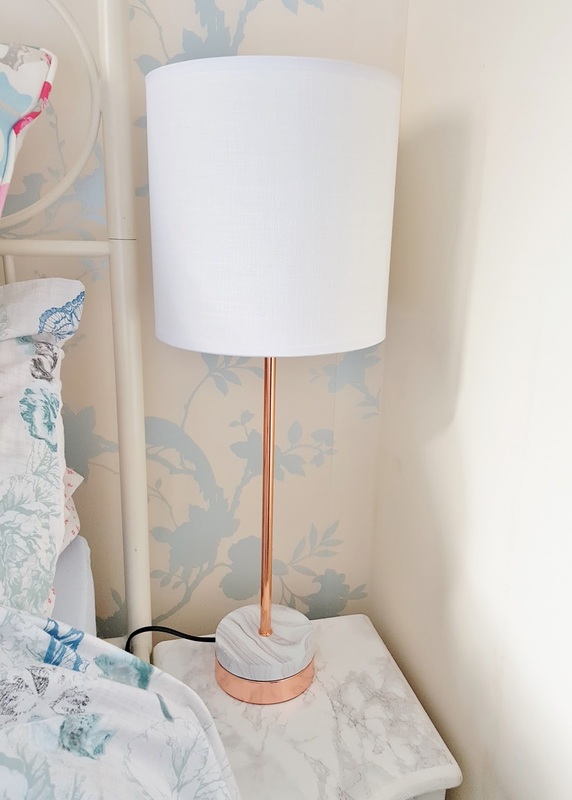 Again, the table was painted white and covered in Marble, and then topped with this stunning copper and marble lamp which was only £10 from The Range! The previous owner left a big chunky gold curtain pole in the bedroom which I hated so it didn’t take long for me to replace it with a narrow cream coloured one (only £8 from B&M). I was very excited to hunt for some curtains and I was thrilled when I found these bird print duck egg blue curtains which I knew would be just perfect for my bedroom! 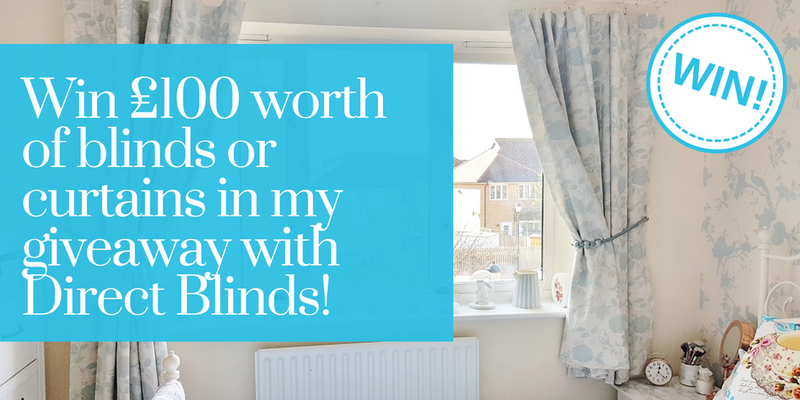 Direct Blinds provide made to measure blinds and curtains that will fit your window perfectly. 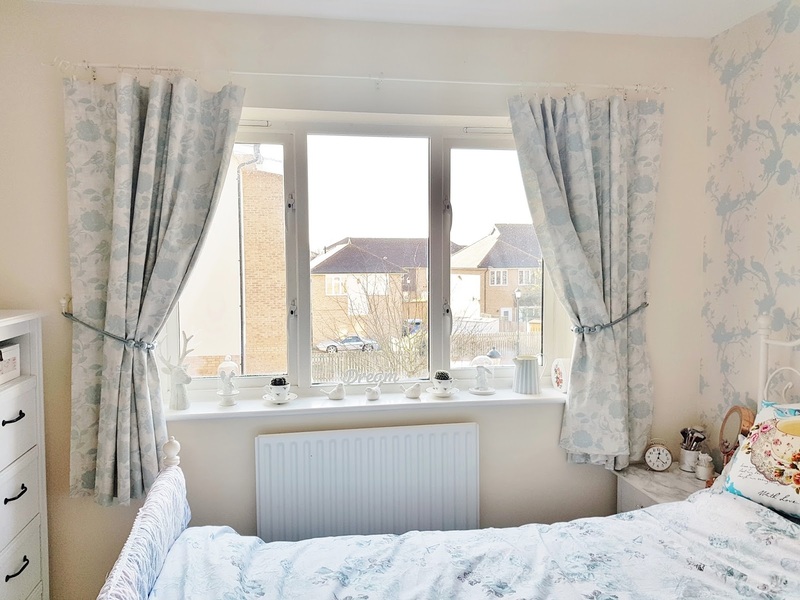 I simply provided them with the correct measurements and they produced these stunning curtains which look absolutely amazing and frame my large window beautifully! I opted to get a blackout lining as I was aware that the fabric is quite a light colour so was worried about light coming though. I’m so glad I got the lining, as I sleep so soundly now and I think it’s because my bedroom is so dark and cosy due to the curtains blocking out all light. The curtains match my new wallpaper and bedding perfectly too! 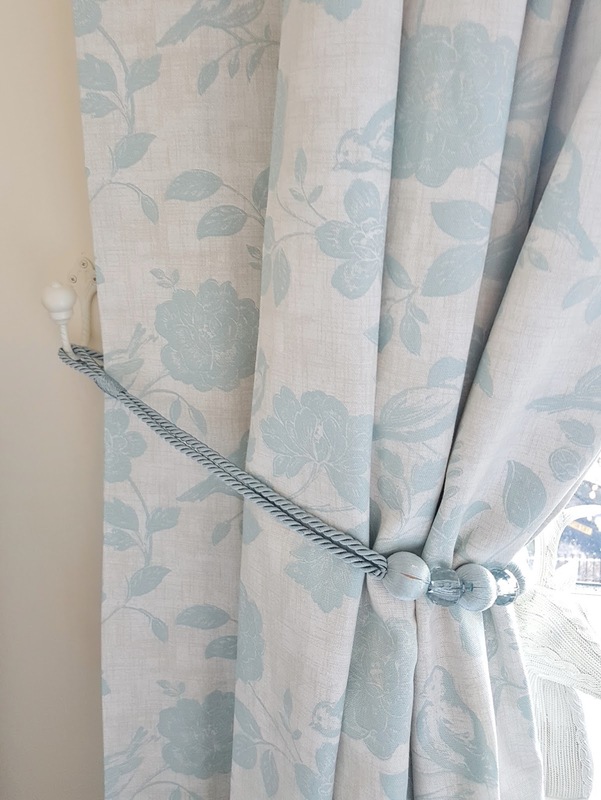 I also managed to find some co-ordinating curtain tie backs in duck egg blue with pretty crystals from The Range for only £4 each, and the cream tie back hooks are from Laura Ashley. 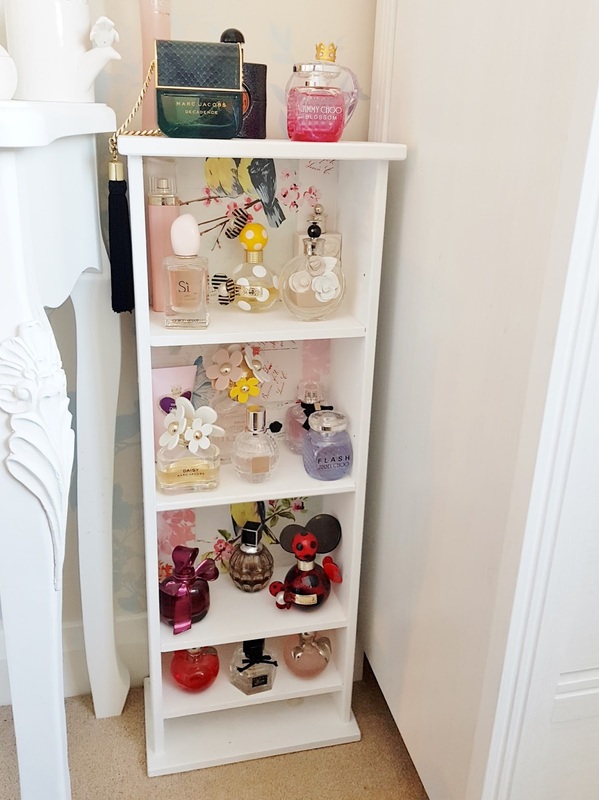 I’ve just about managed to squeeze all my furniture into the bedroom including my little perfume shelf that I bought from a carboot sale for £1 and then upcycled (read here). 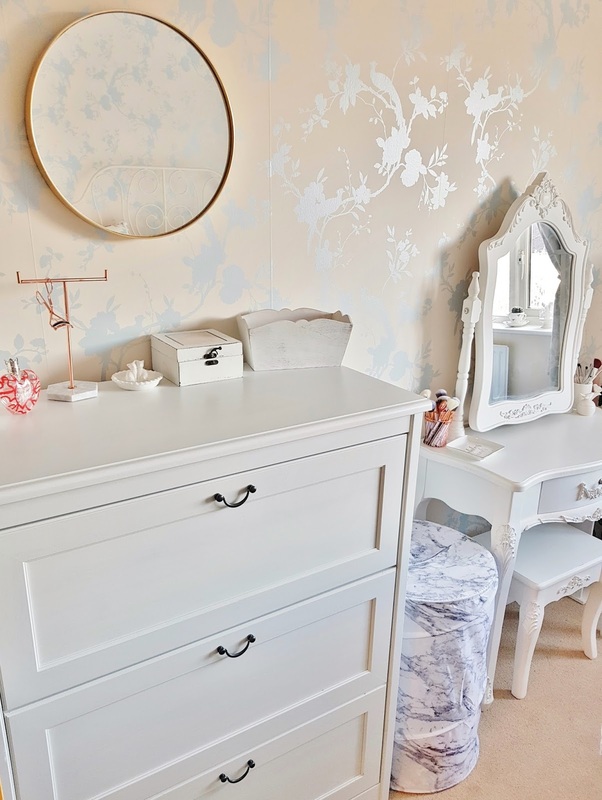 I even managed to get my beautiful French style dressing table in at the bottom of the bed which I was very pleased about, as I had originally thought I’d have to leave it at my parents! 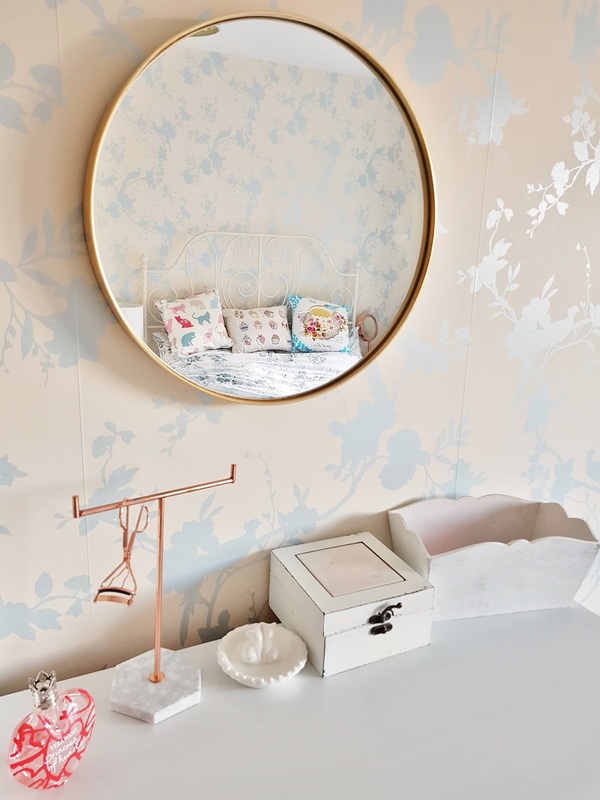 One of my favourite features in the bedroom has to be my beautiful new mirror from Exclusive Mirrors. This round gold frame mirror is simple yet elegant and looks stunning on my bedroom wall. I decided to hang it above my chest of drawers as this is where I tend to stand to do my hair in the morning, so it’s in the perfect position! I like the size and unusual shape, and the fine gold edge co-ordinates with the other metallic tones within the room. I’m so pleased with the wallpaper that I managed to find as I was looking for something similar to my old dressing room wallpaper. The wallpaper I had up in my dressing room I bought from Laura Ashley but it was £44 a roll! I couldn’t afford that, so I tried looking for something similar and was very excited to find something almost identical for a fraction of the price. The Arthouse Chinoise Shadow wallpaper (£9 per roll) is a very close match to the Laura Ashley Oriental Garden wallpaper (£44 per roll). Plus, I managed to get the wallpaper even cheaper for approx £2.60 per roll by bidding on a listing on eBay for 5 rolls which I won for £13! At my parents house I had a bedroom with a wall to wall built in wardrobe which meant I could store hundreds (yes.. literally hundreds!) of dresses. But now with a smaller room AND I have to share with a boy, wardrobe space is much more limited! 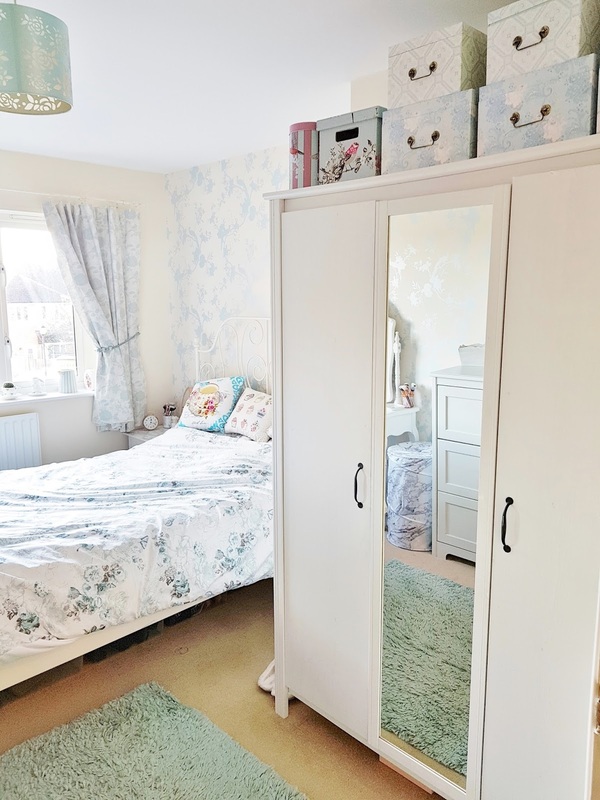 I found a triple door wardrobe for sale on Facebook for only £50 which happened to match my other white Ikea furniture. It also just happens to fit perfectly in the ‘wardrobe space’ in the room. I’ve had to do a bit of a wardrobe detox to fit a proportion of my clothes in, and I’ve also got my Dad to put a second rail at the bottom of the wardrobe so I have a little extra space to fit my skirts. The wardrobe has a full length mirror attached which helps to save space as we don’t need to find another place for a long mirror. 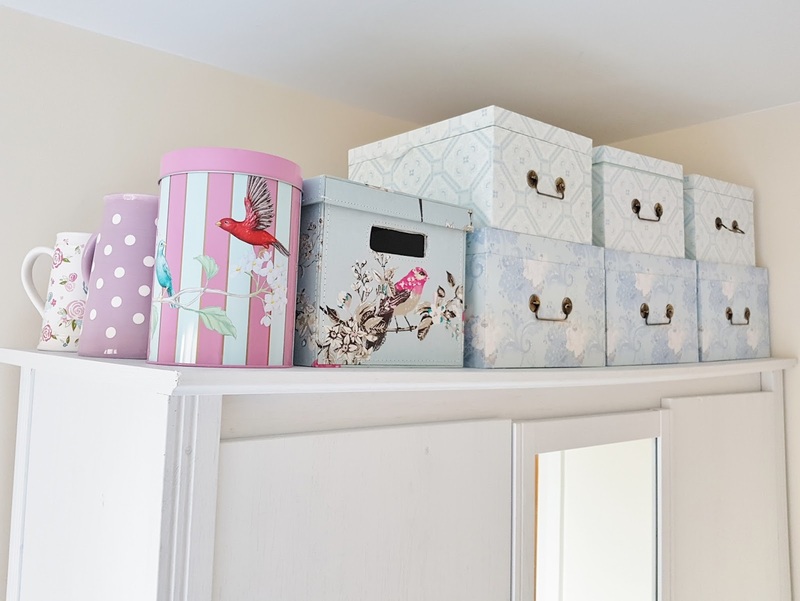 The wardrobe is pretty full but I still have a bit of space for any new purchases made, and I also have space on top of the wardrobe where I’ve put some of my Laura Ashley storage boxes, which currently contain shoes! I hope you enjoyed my bedroom tour! I love it, it's so pretty. I especially like how you have displayed your perfumes! Btw I have the same bed from IKEA! Your house is so pretty! (I've seen the pics on Insta I'm not a stalker!) I love all the pastels and the calming effect they have. I'm deffo gonna keep these tones in mind when I re-do my room next year.